TORONTO -- A controversial mine being developed by a Canadian company in Arizona shows the lengths to which the industry will go to feed the world's unrelenting demand for copper. Hudbay Minerals Inc. (HBM.TO) and a previous owner have been pushing to get approval for the Rosemont mine for more than a decade amid local opposition and skepticism from regulators about water issues in the semi-arid region. 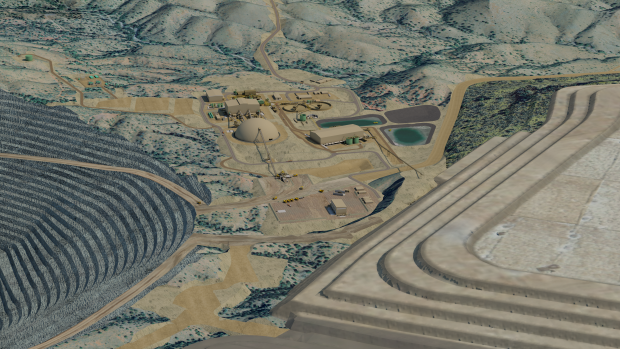 To secure approval for the nearly US$2-billion mine the company has proposed numerous measures to reduce impacts on the environment, including what it says is an "unprecedented" use of dry-stack tailings. The company plans to squeeze water for reuse from about 528 million tonnes of processed ore, the equivalent weight of close to 5,000 CN Towers, to reduce water use by about half compared with its consumption if it were to use conventional tailings. The plan, along with commitments to restock aquifer water and other steps, proved enough for regulators after the Army Corps of Engineers approved the final key water permit for Rosemont earlier this month and the U.S. Forest Service granted the final administrative approval Thursday. Critics, however, say the measures still don't go far enough, as concerns about water rise in the face of climate change and other countries take measures to further crack down on water use in mining. "This mine is the wrong mine in the wrong place," said David Steele, spokesman for the Save the Scenic Santa Ritas advocacy group, named for the mountain range where the deposit sits. The group is concerned about a broad range of impacts, including water, for a mine that will include a pit some 1.8-kilometres across and almost a kilometre deep and involve shifting over 1.1 billion tonnes of waste rock. Kathy Arnold, Hudbay's director of environment, said in a statement that the mine plan was done with the environment and laws in mind, and approval shows they met government requirements. "Regulators grant permits considering their policies. If you can meet those requirements, you get a permit." There have, however, been disagreements among various regulators through the process as to how well the company's plan will limit impacts, Steele said. "They're going to reject years and reams of technical studies that have said this mine threatens the water resources of southern Arizona. That's a problem." Assessments by the Environmental Protection Agency raised concerns about water impacts, concluding in a 2017 report that "the Rosemont Mine will cause or contribute to significant degradation of waters of the United States" and that "discharges of fill material into streams and springs to construct the mine site will cause unacceptable adverse impacts to wildlife and wildlife habitat." The Army Corps of Engineers, which awarded the final water permit, had itself noted in 2016 that the mine would contribute to the degradation of outstanding Arizona waters. Some of the mitigation plans for the company's use of 7.4 billion litres of water a year, such as restocking the aquifer from the Colorado river, have added complexity and uncertainty because of drought and reduced water levels generally. This past week seven U.S. states reached an agreement to cut water use from the Colorado in the face of a 19-year drought and depleted reservoirs. Even at the stream level though, there can be disagreement on how well a plan actually lessens the impacts of the mine, said Tom Myers, a hydrologic consultant based in Nevada. "A spring is a lot more than simply a source of water at the surface of the ground. It's an ecosystem. You can't simply replace water and say, oh, we've mitigated it." Despite the impacts, the company says mining in drier places can be more prudent. "Mining in an arid environment is probably more environmentally appropriate than mining in a wet environment where there could be the risk of acid rock drainage, leaching of materials, or tailings facility structure failure," said Arnold. While some risks are lessened in drier areas, countries with more extreme water woes are taking measures to crack down on water use. Copper-rich Chile last month said it would more than double the areas protected from mining as copper and lithium miners compete with locals for scarce groundwater. The country also moved several years ago to block Barrick Gold Corp.'s giant Pascua Lama mine high in the Andes over concerns it was damaging glaciers and water supplies. Copper producers in the country have already invested to reduce water use, including BHP's opening of a US$3.4-billion desalination plant last year to pump water to the world's largest copper mine. Anglo American installed floating solar panels at a Chilean mine to both generate energy and reduce water evaporation. Companies are responding to water stresses as they expect increasing constraints in the future. A report by CDP, which advocates for environmental impact disclosure, said that by 2030 more than a quarter of operations at the world's 12 largest miners will be exposed to high water stress areas, especially in mining heavy countries like Chile, Australia and South Africa. The increased concerns come as many mines require increasing amounts of water to process diluted ore, said Luke Fletcher, a senior analyst at CDP. "In the last decade or so we've seen lower ore grades and deeper ore bodies, and that will require a lot more water to process."